Fingers in the way. Missed or misunderstood inputs. Imprecise control. The problems with trying to play games on an iPhone are well-documented. But the iOS 7 era has ushered in controllers. Glorious plastic housings that will make oily, greasy screens of frustrations a thing of the past. I touched one of them this week and my experience was promising. The whole thing is pretty light, despite its size. Better still, there's a firmness to it that's satisfying, especially when compared to the cheap feel of MOGA's newly-released Ace Power controller. The buttons and d-pad are analog, so they'll be sensitive to the amount of pressure applied. Most games don't have pressure sensitivity functionality built in yet but the controller will be there when they do. The PowerShell uses a hardwired connection with a Lightning dongle on the right side of the housing. No wireless tomfoolery here. I sampled a few games using the PowerShell, which improved the act of playing action and platformer-style games greatly. The few minutes I spent with Limbo, Lego Lord of the Rings and MetalStorm Aces was smooth. I could see the whole screen and didn't experience any flubbed moves. Some games already recognize the controller is attached and change their on-screen prompts accordingly, saying press A, for example, instead of tap. As the name implies, the PowerShell also houses a back-up battery that charges via micro-USB adapter. 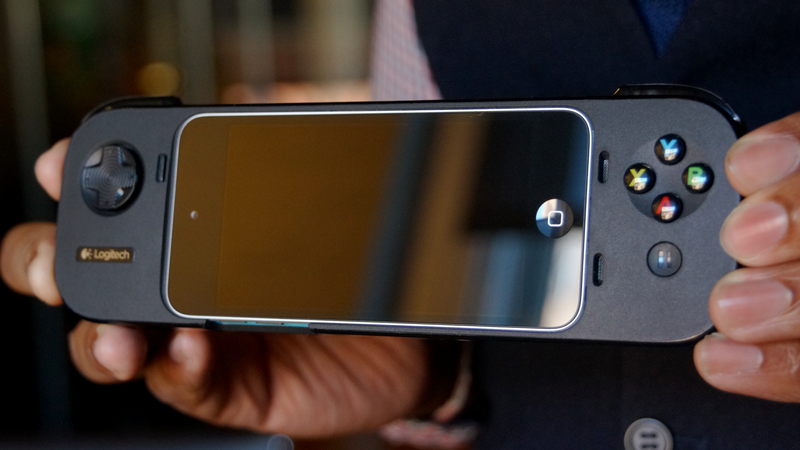 Logitech claims the battery will double the life of the iDevice it's attached to. It's also got built-in speakers, too. All of this will cost $100 when the controller comes out in December. Kotaku will have a full review once we get a unit in our hands.